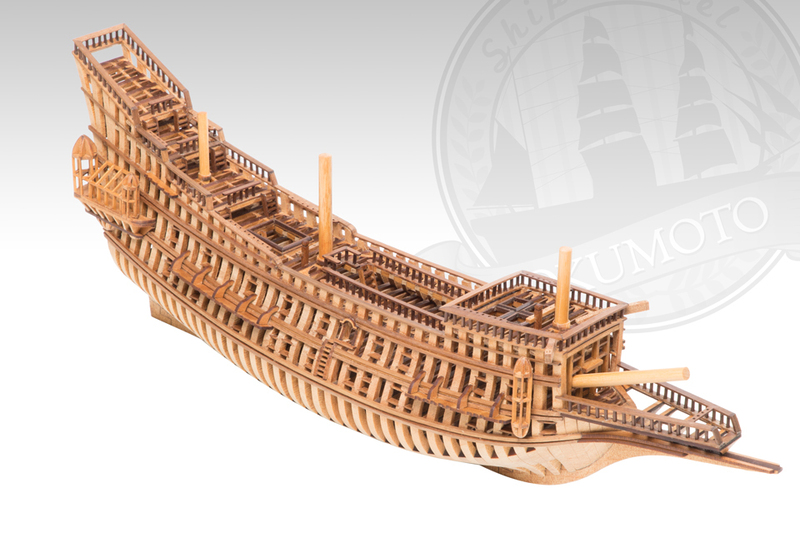 Construction times on these kits vary from an estimated 100 hours for the Hannah, on up to 240 hours for HMS Endeavour. These build times are far lower than what ship modelers usually have to face when building ship models. Normally, models like these have to be built from scratch or from semi-kits (like those from The Lumberyard), and can take many months to a year or more to complete. 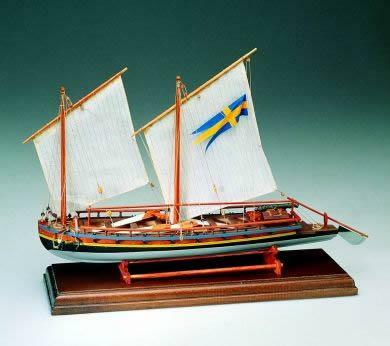 Santa Maria by Ship Model Okumoto in 1/80 scale. Given that these models require only enough sanding to clean up the char on the laser cutting and to bevel the frame edges, I suspect that working on these models should create a fairly limited amount of dust. Now, don’t quote me on this, but I believe the intent of these kits is to build them as is – that they are not just the beginnings of a model to be planked over, painted, rigged, etc. You might be able to do that if you really want, but I think these are pretty well designed to be stand-alone kits. HMS Endeavor from Ship Model Okumoto in 1/80 scale. Of course, the kits, being from Japan, have instructions written in Japanese, but these days, phone apps like Google Translate, make that pretty much a non-issue. 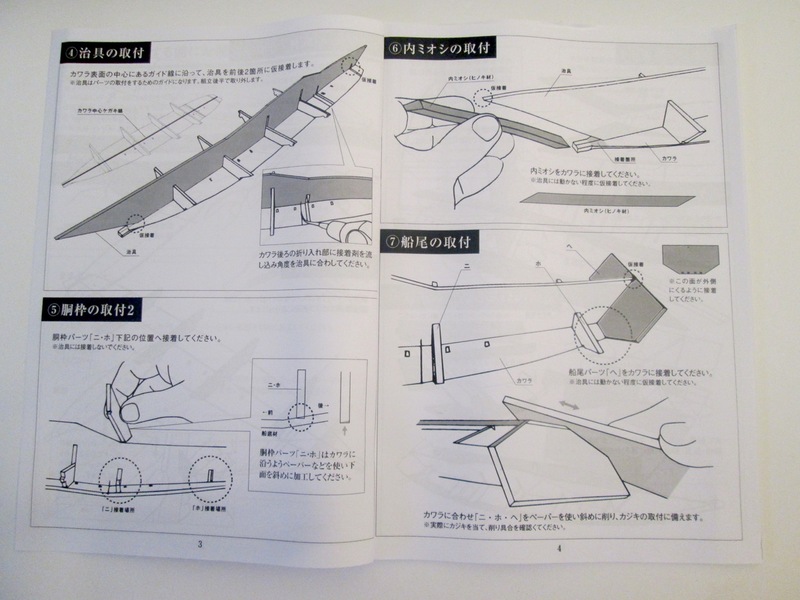 Plus, I understand that the instructions are well illustrated with color photos. This entry was posted in Kit Reviews, Ship Modeling News, Vendors and tagged Ship Model Kit Manufacturer on June 30, 2018 by catopower. I’ve recently found myself spinning my wheels on the ship modeling front. This happens from time to time with my projects when I get a bit overwhelmed or stuck. 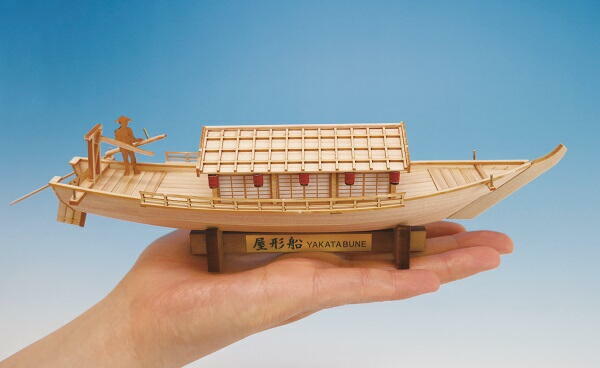 My scratch model of a Japanese rice field boat, the Gifu Tabune, was one kind of distraction to work on. 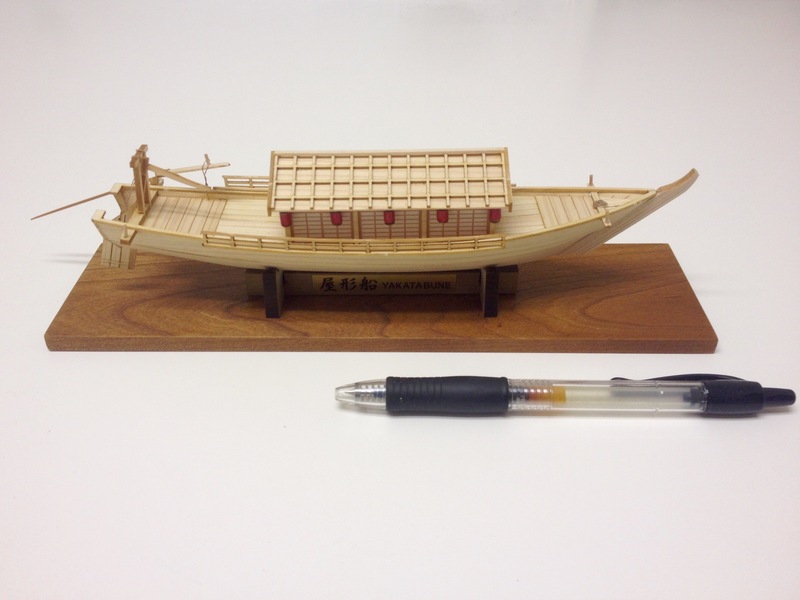 That took only a couple days, but there was a lot of thinking that went into that build, since it was from scratch, and I’m still learning a lot about Japanese traditional boats. The ideal would be a simple kit, where I can just build it and not spend a lot of time on it or have to put a lot of brain power into it, as I’m in short supply these days. As it turns out, I’d purchased a collection of simple Woody Joe kits from Zootoyz. If you follow my blog at all, you’re already aware that I am always recommending purchasing from the online Japanese hobby dealer Zootoyz.com for those looking for, among other things, Woody Joe kits, which are not available directly in the U.S. 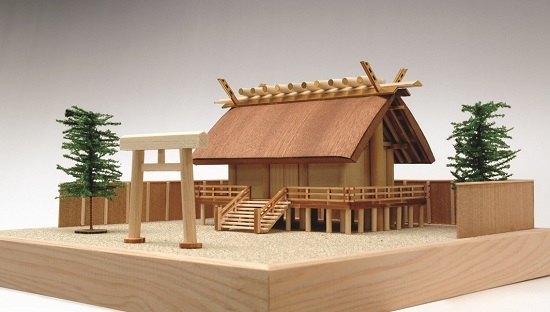 This entry was posted in Kit Reviews, Non-Ship Models, Shinmei-zukuri shrine, Woody Joe and tagged Japanese Shrine, Zootoyz on April 24, 2017 by catopower. The sail training schooner Sir Winston Churchill is a beautiful looking 3-masted, steel-hulled schooner that was originally launched in 1996 to compete in the Tall Ships Race. Woody Joe’s revised kit was released in 2015. The model is 1/75-scale and measures 24″ long and just over 20-1/2″ tall. Like other Woody Joe kits, the model features plank-on-bulkhead construction, using Woody Joe’s box-frame structure, which is designed to help the modeler more easily achieve good alignment of the parts. 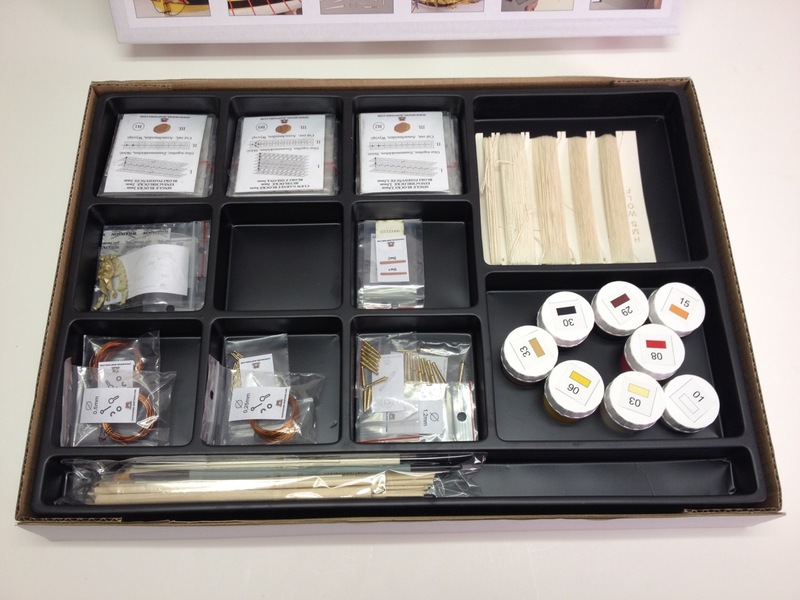 The kit features lots of laser-cut wood parts, with a healthy supply of both cast metal and photo-etched brass parts. The only plastic parts in this kit are the lifeboats and rigging blocks. It no longer surprises me to look inside the box of the Woody Joe kits. Their ship model kits fit well in the box, and everything is plastic bags, so that the box is full, and the bags are so numerous that they provide a certain cushion, keeping items from getting knocked about and damaged in shipping. One sheet of styrofoam fills the remaining space underneath, keeping things from bouncing around in the box. 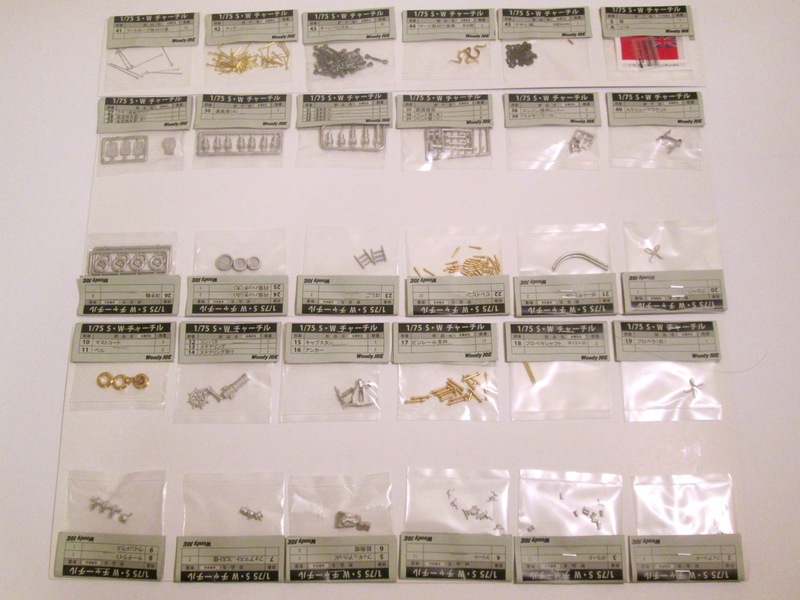 Small parts are organized into separate bags, with each bag carded and labeled with the part numbers, descriptions (though in Japanese) and quantities in the bag. Small bags are stapled to a cardboard insert that keeps the box nice and neat. 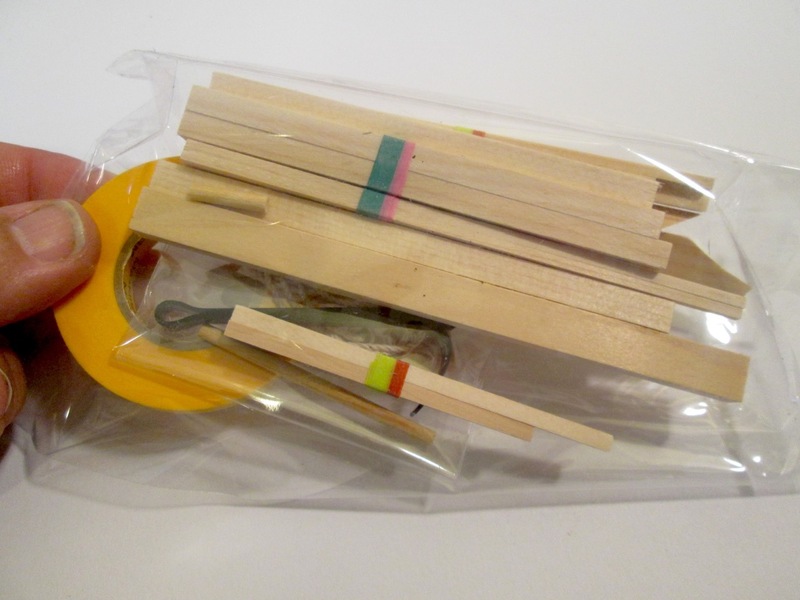 A small coardboard tray at one end seems to be a standard packing feature of Woody Joe kits, and contains any loose packages of parts as well as the spools of rigging line. The plans consist of 7 sheets of A3 sized paper, 13″ x 19″ each. Six of these sheets are pairs, so that they make up 3 larger drawings. 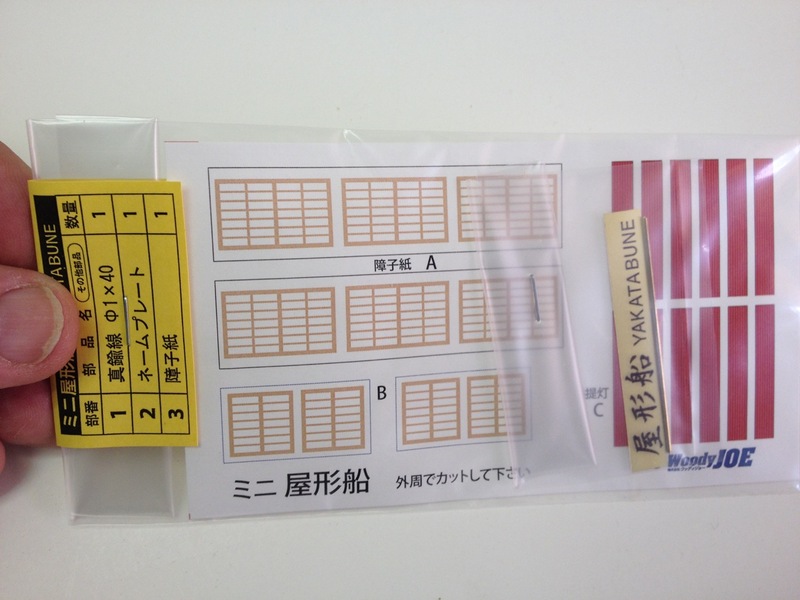 Registration marks are provided, allowing you to align the sheets properly. Some of the older Woody Joe kits have larger sheets, but I expect that there is a cost-cutting move to these smaller sheets as they can be printed on a large office laser-printer instead of a dedicated plotter. Given the alignment guides, this shouldn’t be a problem for the builder. There is one oddity, however, in that the models is about 1/4″ too long for the plans. The result is that the top of the jackstaff at the stern is cut off. This is a minor issue, but it’s a little odd to look at. I don’t it will create a hardship for any builders. 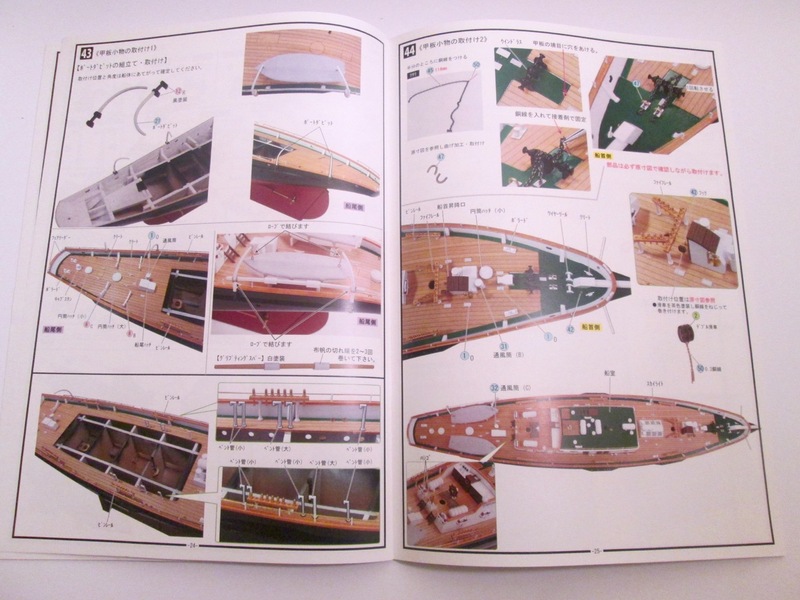 The instruction book is extremely well illustrated with steps clearly identified, and lots of color drawings and photos. Being that this is a Japanese kit made for the Japanese market, all the text is in Japanese. This may put off many potential builders outside of Japan. 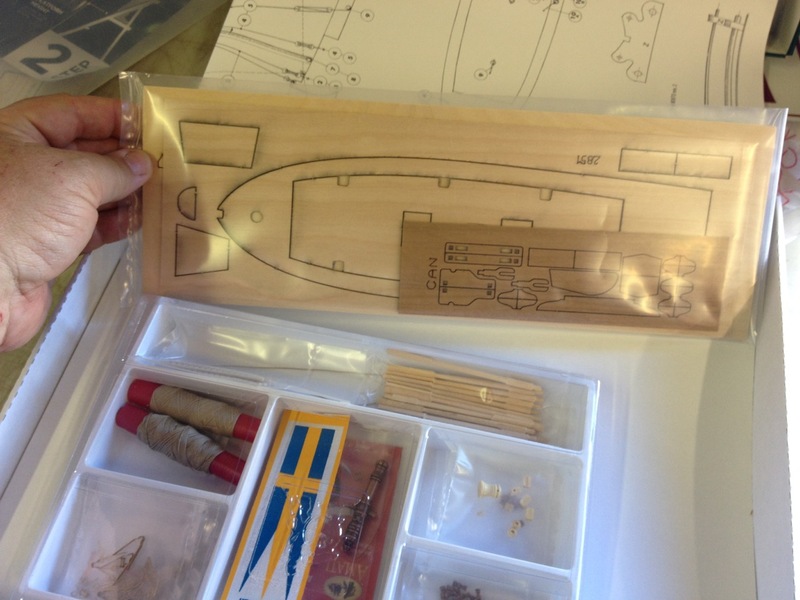 However, if you are an experienced ship modelers, you shouldn’t have any trouble with the instructions. 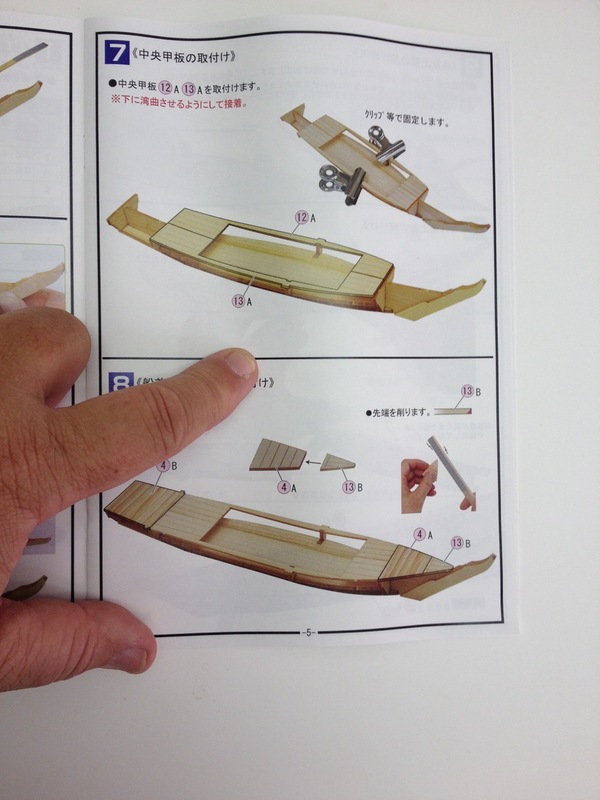 That may not be true of complicated kits of non western-style ships like Woody Joe’s Higaki Kaisen kit. 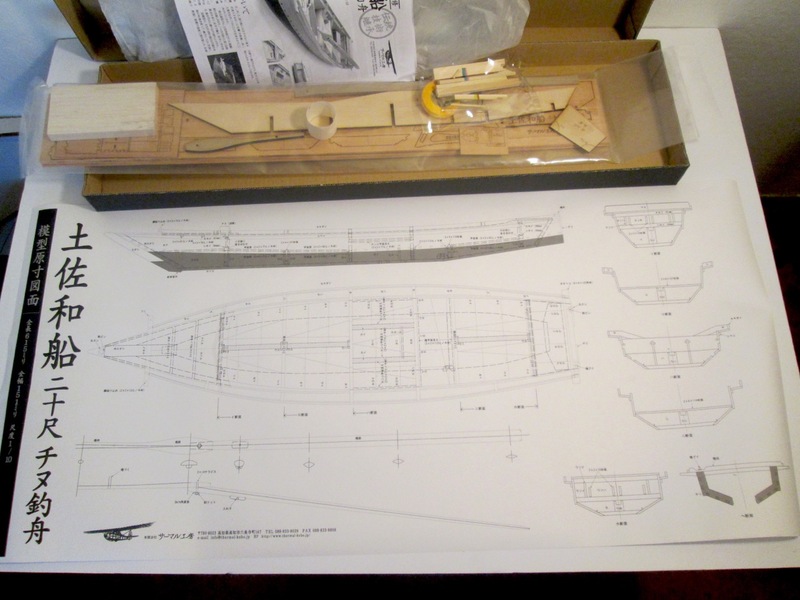 But, for the schooners, galleons, clipper ships, yachts, and sailing ships and barks that Woody Joe makes, there’s probably nothing out of the average ship modeler’s experience. Most of the text in the instructions and plans are labels. There are some instructions, but most are pretty simple in nature. If you look at the example below, Step 8 tells you to use a strip of wood to help you determine the correct bevel of the bulkheads. A close-up of a frame edge highlights the beveled edge. In another example, Step 11 shows you to use alignment marks laser-etched onto the bulwarks piece to get the position correct. Woody Joe does a good job at “dummy-proofing” the process by putting two alignment marks, one for each edge of the bulkhead, so you would have to go to extreme measures to mess up the step. The same step also shows you to pre-bend the bulwarks piece with a photo illustrating how you can bend it over a curved surface, like a large bottle, to apply the curve. One suggestion though, make sure you dampen the wood before you try to bend it. Another piece of advice. Look ahead a step or two, particularly when you see red text in the step your on, to make sure it’s telling you not to glue something in place yet. Sometimes, a part, like the deck in this case, is just used temporarily to aid in alignment. If you look at the next step or two, you’ll notice that the part is no longer in place. That’s a good clue that you’re not supposed to glue that part. Also, in any red text, look for a step number. If you jump to that step, you may see where the part does get glued into place, helping you get a better handle on the big picture. Being that this is a model of a steel hulled vessel, Woody Joe’s method of hull construction is particularly well suited. 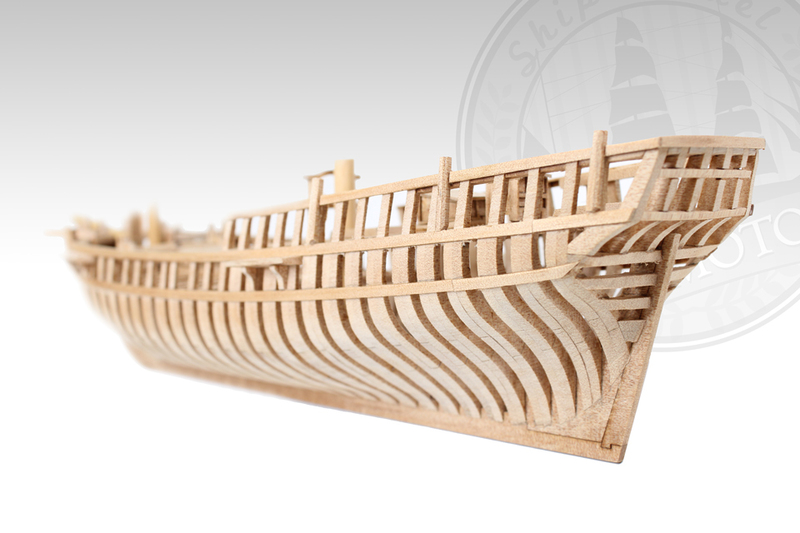 The stern, in particular, requires a stack of laser-cut blocks that you must file to shape. This works just like bread-and-butter style hull construction, with the blocks pre-defining your contours for you, making it very easy to get exactly the right shape. My steel-hull comment above refers to the fact that with some models, you want the lines of planking to show. But, this method used the stern block un-planked and flush with the hull planking. On a model of a steel-hulled ship, this is a non-issue, as you want a good smooth surface anyway. And the method results in an accurate hull shape. 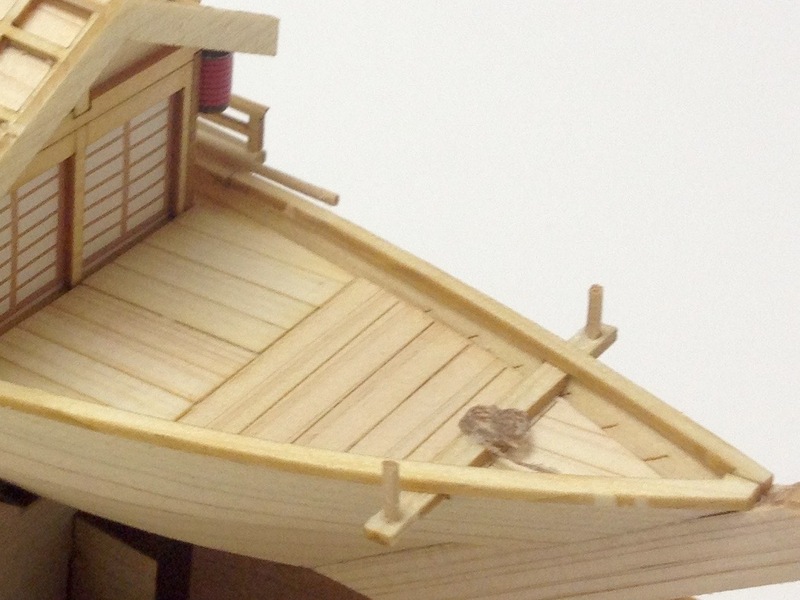 On this model, the deck is not planked. Instead, you are provided with a single laser-scribed sheet, with all the deck planking and waterways already marked for you. The wood in the kit is made up of at least three types. 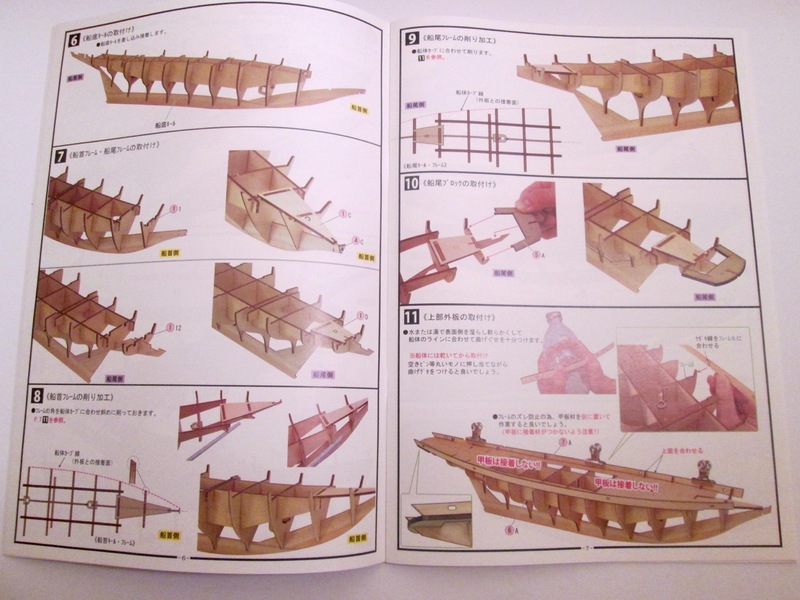 The frames are made of some type of plywood that resembles birch; the remaining laser-cut parts and most of the strip woods are Hinoki, or Japanese cypress, a very pleasantly aromatic wood that is stiff and slightly brittle when dry, but bends easily when wet; and some structural parts, such as the stern blocks, are a fine-grained, grayish wood called Ho (I don’t know the western equivalent name). 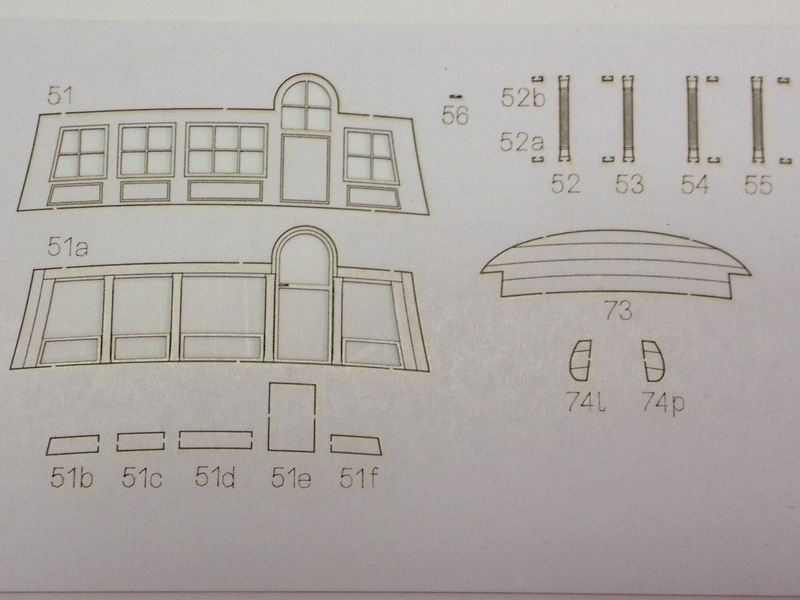 All laser-cut sheets are also laser-scribed so that part numbers are clearly identified on the part or next to it. Woody Joe also makes good use of scribed lines to create alignment guides and beveling guides or, in the case of the deck sheet, the outlines of the planking. 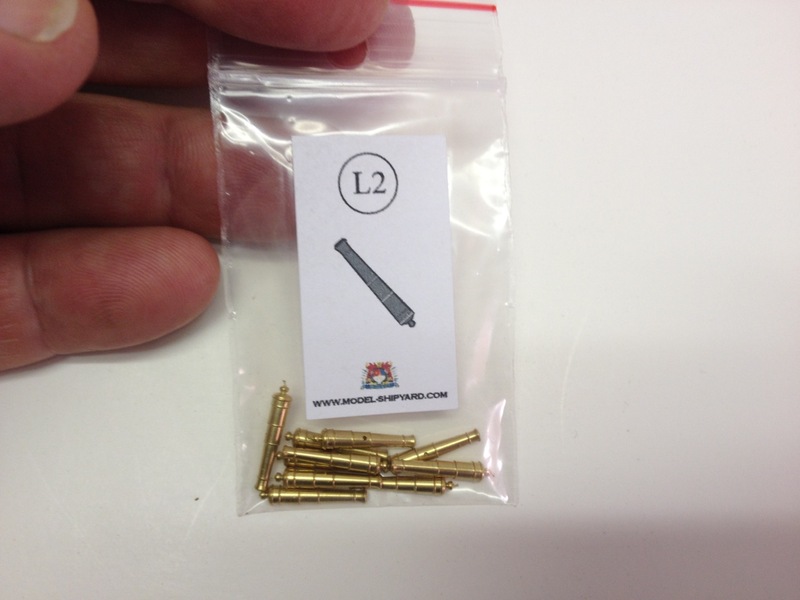 As I mentioned before, fittings are well packaged and identified. Each pack is carded, includes the part number and quantity. Note that Woody Joe’s quality control is very good, and I’ve yet to hear of missing pieces. But, if the model calls for 20 turnbuckles, as shown below, that’s exactly what you’ll get. There’s no extras thrown in, so make sure not to lose anything, as it’s not going to be very easy to claim that the kit was just missing a piece. Those who don’t like plastic, can easily upgrade these few parts using commercially available fittings. 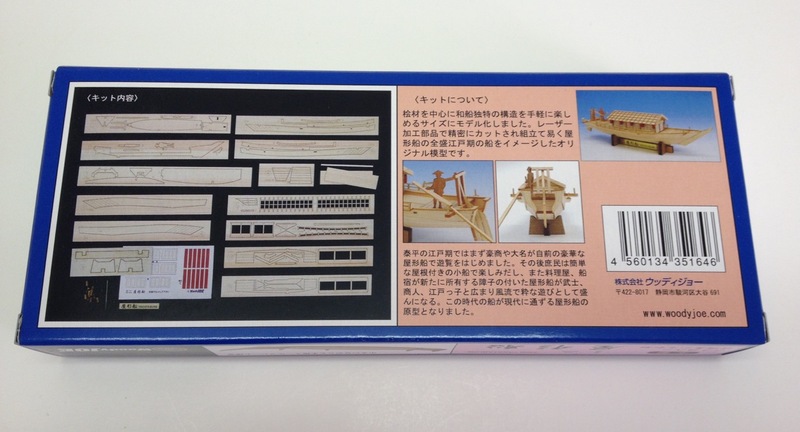 My preference for wooden blocks would be for those made by Syren Ship Model Company. Being that this is a 1960’s steel-hulled schooner, perhaps metal blocks such as those sold by BlueJacket Shipcrafters might be more appropriate. Cast metal parts are plentiful and the castings are of excellent quality. I’ve had someone ask me about them before and I’d send them photos, and after getting the kit, they told me the photos didn’t do justice to the high quality of the castings. They’re very good. 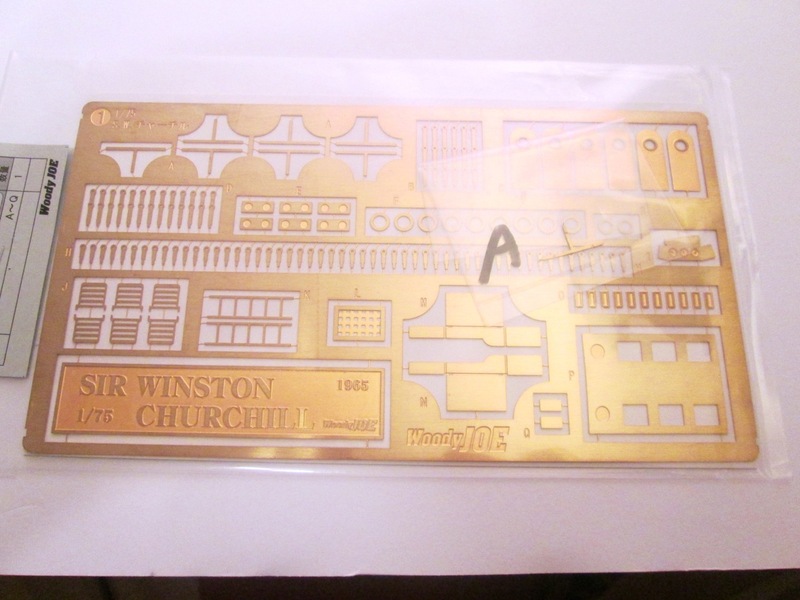 There’s also a nice sheet of photo-etched brass parts, some turned brass parts, etc. 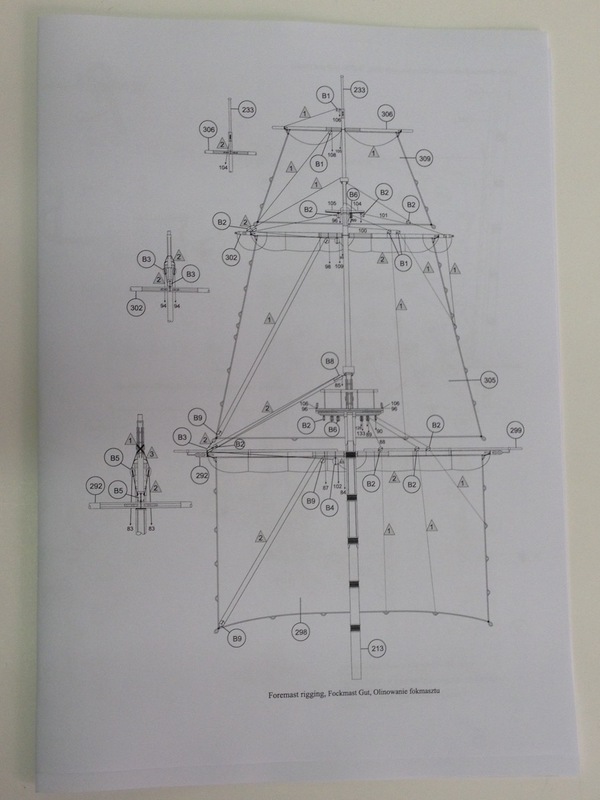 The kit includes three sizes of black line for the standing rigging, and one size of tan line for the running rigging. 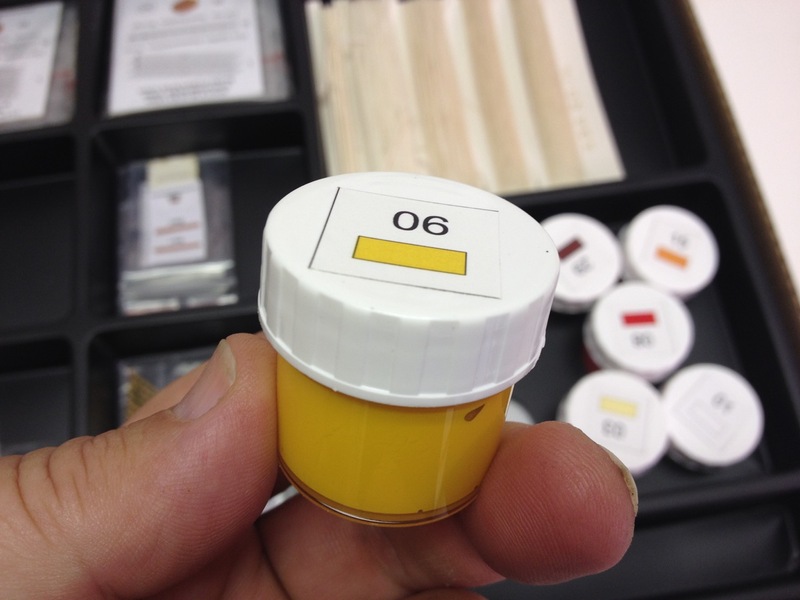 These are provided on plastic spools, so there’s no worry about your line getting tangled and knotted. The sails are a stiff cloth, possibly, this is pre-stiffened in some way, as the cloth comes rolled, not folded. 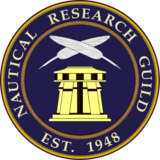 The material is printed on one side, and the ink used is a beige color, so the lines of the sail are subtle, as they should be. Really, this is an excellent looking kit. I think the detail is better than the Kanrin Maru kit that was the first Woody Joe kit I’d ever reviewed. I was actually pretty excited by what I could see of this revised kit when it was released, and I haven’t lost any of my enthusiasm for it when I looked it over in detail. 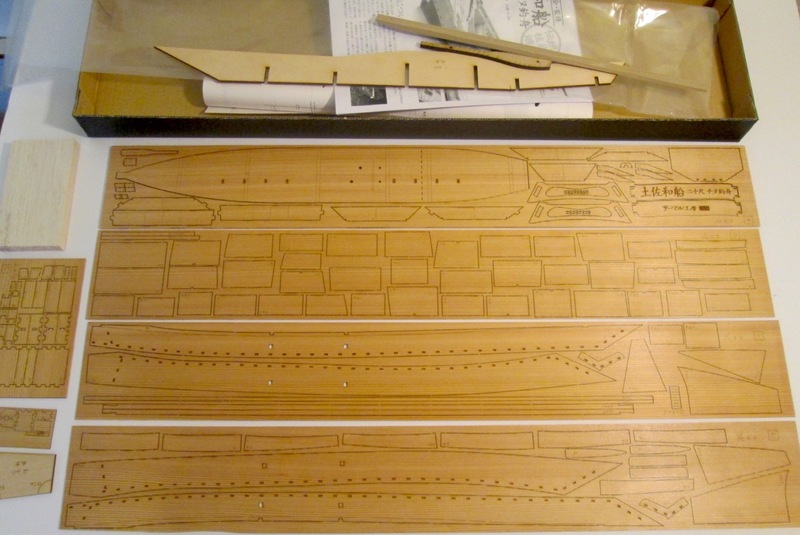 Wood Joe kits are, however, designed to be relatively easy to build, and there are sometimes simplifications that experience ship modelers might not like. But, these seem to be pretty minor in this kit. In fact, some things that I might consider a weakness, are just a matter of personal taste, like the use of a plastic for the blocks and dinghies. There is really just one weaknesses that I can see in the Woody Joe kit, and that is that the laser-scribed deck sheet is thin and a little delicate, and will require some care to work with, as I’ve discovered in working with the kit. In particular, the deck is weak along the laser scribed planks. If you run into any issues, I recommend reinforcing the deck by gluing some short wood pieces underneath. Just make sure that they don’t interfere with where the deck rests on the framing. You might even want to do this before you run into any issues. Less of a weakness, and more just a simplification, is that the way the mizzen sail attaches to its mast. The use of mast hoops are shown, but I believe the real ship doesn’t use mast hoops there, because the spreaders on the mast would interfere with the raising and lowering of the sail. Instead, I believe there is some internal track inside the mast to which the sail attaches. I don’t know how a kit manufacturer would design this in a kit thats supposed to be a fairly easy build. Certainly, just using mast hoops is simple. Another simplification are the yokes on the ship’s squaresail yards. 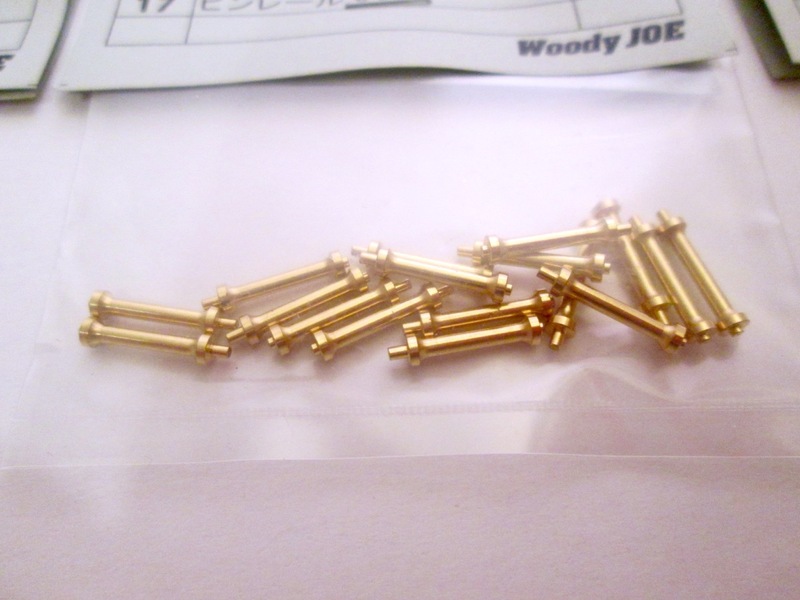 These are simply made from stamped brass in the Woody Joe kit. This is the same thing they do in their other kits as well. I’ve tried to catch a glimpse in photos on the Internet of what these look like on the real schooner, but I’ve had no luck. I’d probably replace this with something that looks a little more realistic, even if it’s not accurate. 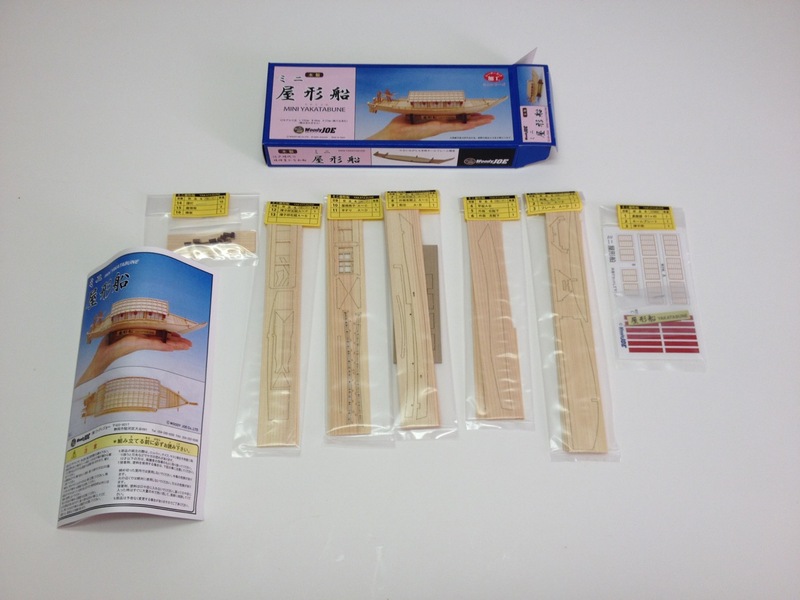 The Woody Joe kit’s of scale of 1:75 is the same as the Billing Boats kit of the same ship. 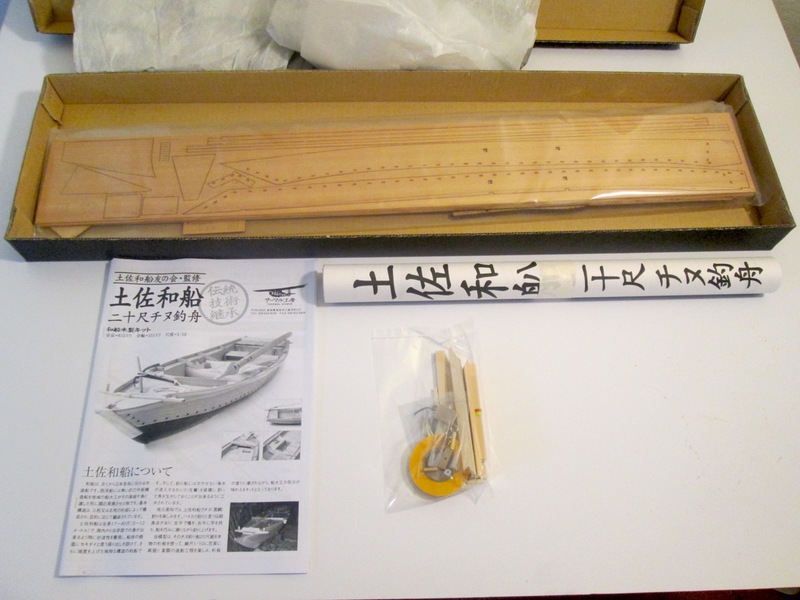 I had hoped to find the Billing Boats kit to do a comparison, but it’s been hard to come by. However, I’m pretty familiar with the Billing Boats offerings and their instructions and plans. Pricewise, the Woody Joe kit lists for ¥30,000. At this time, that’s about $300. The Billing Boats kit, by contrast, lists for $249 at Ages of Sail, which is the U.S. distributor for Billing Boats. Having seen other Billing Boats kits, the main comment I can make here is that the packaging of the Billing Boats kits doesn’t even come close to the care taken with the Woody Joe kit. Most Billing Boats kits are put in oversized boxes that are sturdy, but leave the parts to slide around inside, often allowing the heavier wooden parts sheets to potentially damage the bags of fittings. I’ve seen this in many cases, where the parts bags get torn in shipping and small parts fall loose in the box and either slip out of the box or end up damaged. 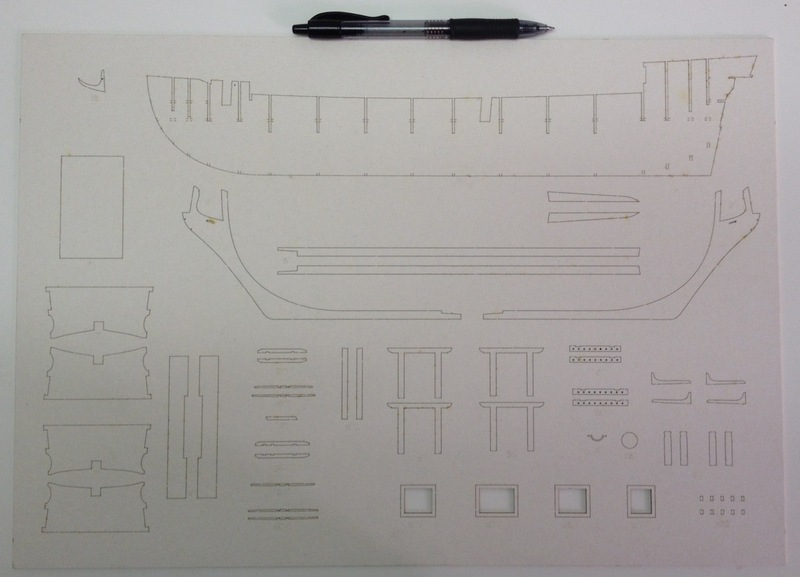 Also, the parts in a Billing Boats kit are usually just all piled into one bag, requiring you to sift through them to find out what’s what, and to make sure you received everything you’re supposed to. 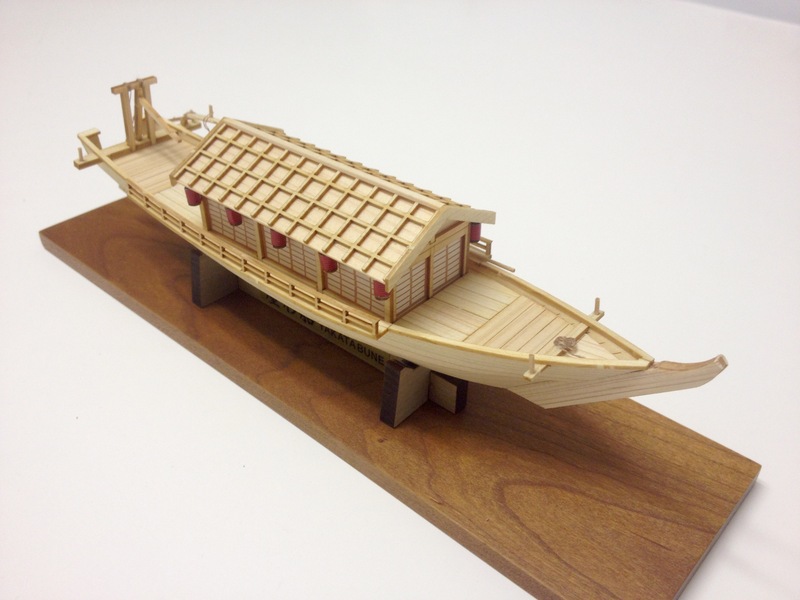 Both the Woody Joe and the Billing Boats kits offer laser-cut wooden parts, stripwoods for planking, dowels for the masts and spars, rigging line, etc. 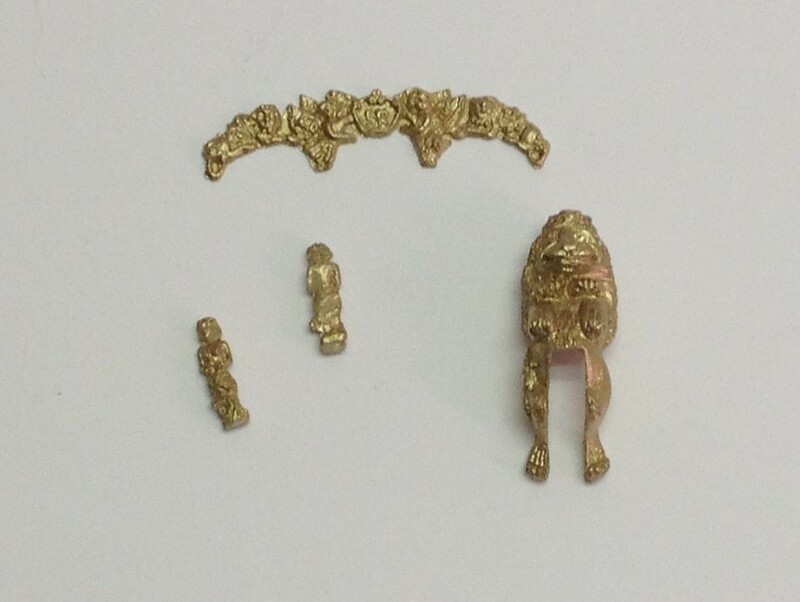 Both offer turned brass fittings, photo etched brass, as well as some plastic parts. But, one difference is that the only plastic parts in the Woody Joe kit are only the blocks and the two dinghies. 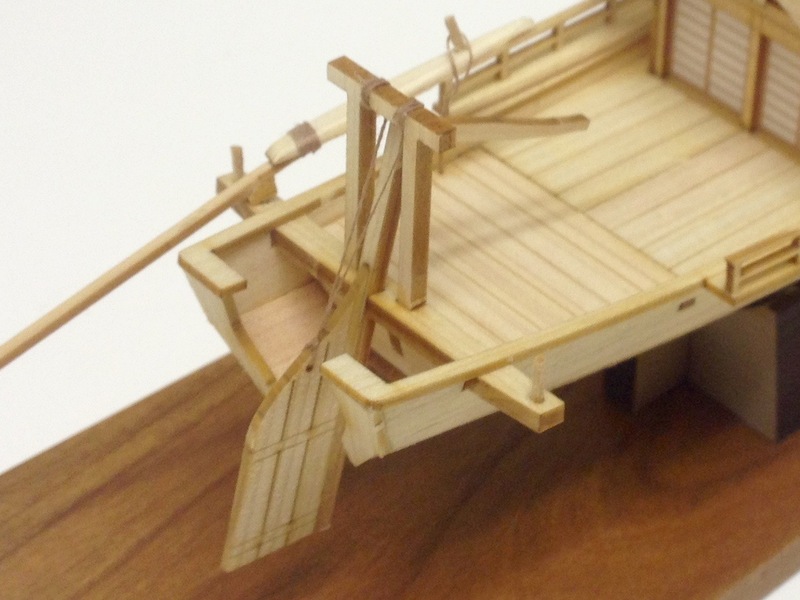 The Billings Boats kit provides quite a few detail parts in plastic, including the props, cabin doors, fife rails, binnacles, ladders, boat chocks, anchors, etc. Most of these are either cast metal or laser-cut wood in the Woody Joe kit, which certainly adds to the cost. 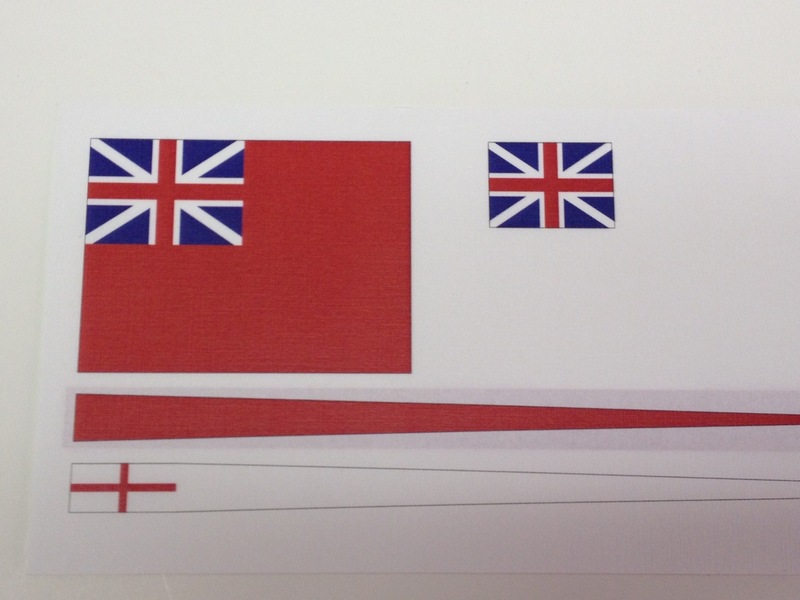 However, the Billing Boats kit does have the advantage of including one page of instruction in English. You can check the Billing Boats instructions out for yourself, as they have the instructions on their website and you can download them here. As for the Woody Joe instructions, simply from the images I posted above, you can see that with any experience, you should be able to build this model just from the numerous color photos and illustrations. 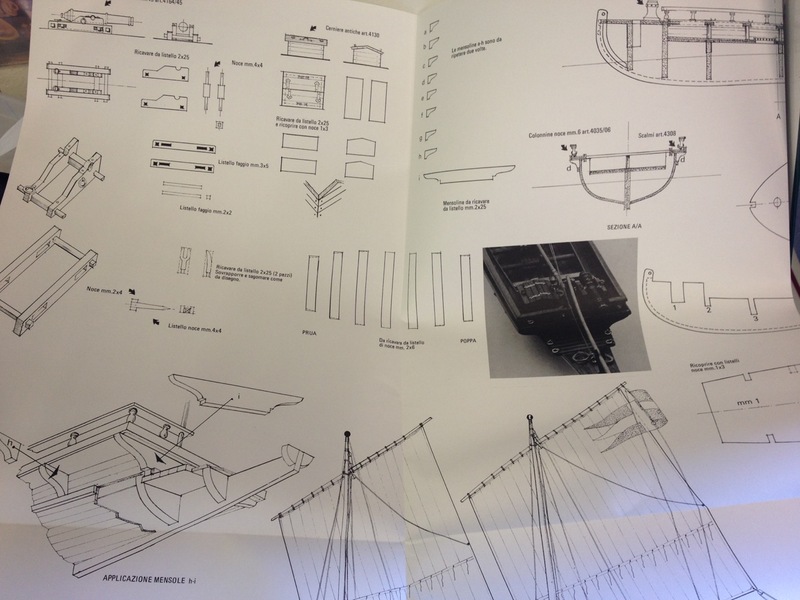 And comparing the two brands, Billing Boats gives you 9 pages that have a large black and white, labeled instructional photo or diagrams, many of which simply show you where things go, plus 3 pages of illustrations of the included parts. Woody Joe provides 33 pages that are packed with color photos and illustrations. That said, I actually do like Billing Boats kits. They seem to do a nice job on overall accuracy of the basic structure of the subject. Where they may be a little lacking in detail, they can be enhanced by a good modeler. And, I for one, am the kind of person that will buy a kit and replace the fittings with ones I like better. So, a cheaper, but accurate kit isn’t necessarily a bad thing. But, if your expectations are high for a kit, and you appreciate quality and want something that will build into a beautiful model with a minimum of fuss, the Woody Joe kit is hard to beat. 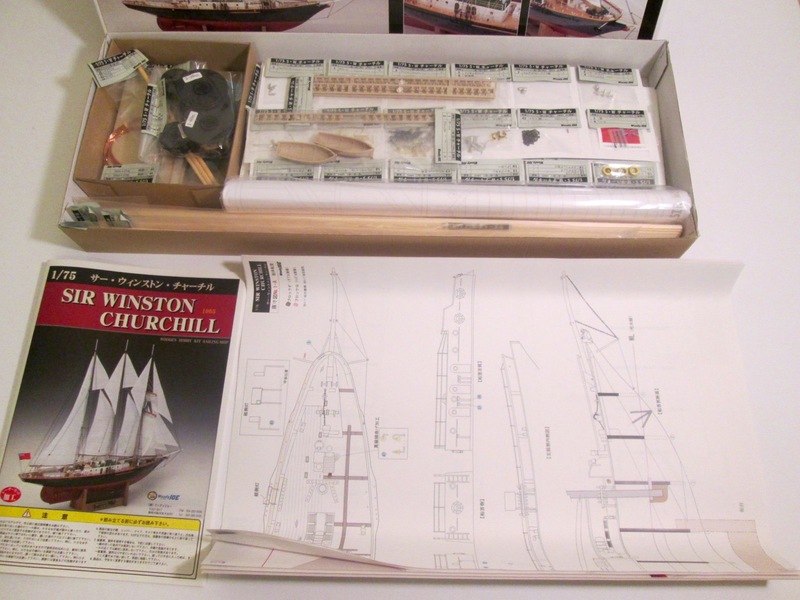 This entry was posted in Kit Reviews, Product Review, Ship Modeling News, Vendors, Woody Joe and tagged 3-masted schooner, Sir Winston Churchill, Wooden Ship Model Kit, Woody Joe on November 9, 2016 by catopower. 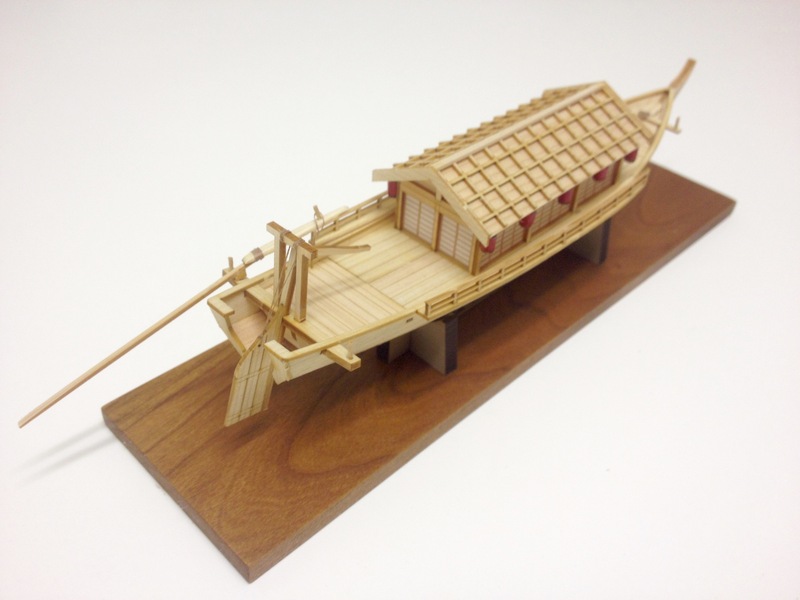 For those who might be interested in finding out more about kits from the Spanish ship model kit manufacturer Occre, check out my out-of-the-box kit review on Ages of Sail’s blog site. 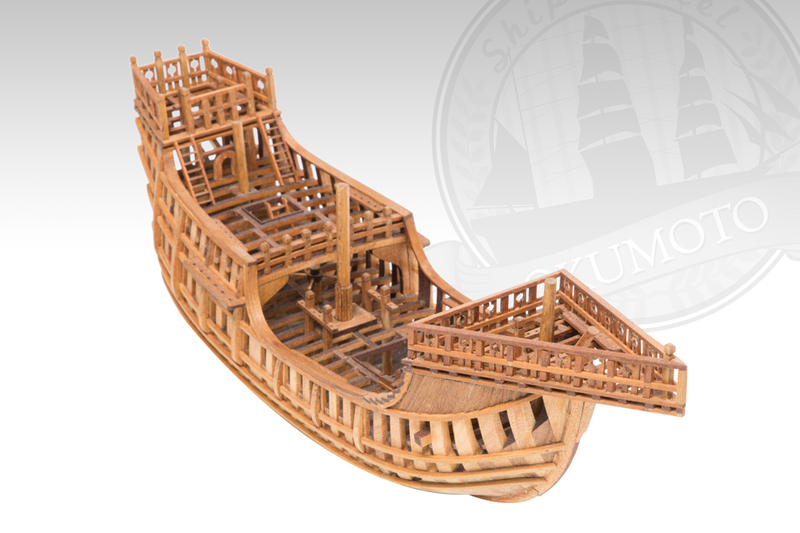 It’s a look at one of their more recent kits, the Buccanner, a fictional pirate ship from the late 16th or early 17th centuries. While I’ve never built one, Occre kits look like nice basic kits. They’re similar in many ways to Artesania Latina kits, but as far as I’ve seen, their instructions are pretty consistent and the plans are very good. Parts quality is on the decorative side, but that’s just the style. 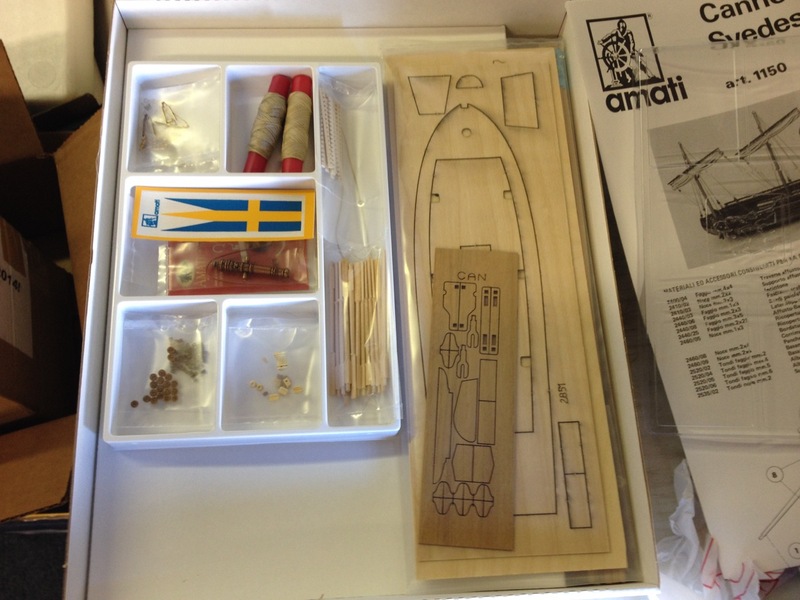 If you’re interested in the kit, you can buy it at Ages of Sail. Or, check out the kit details here. 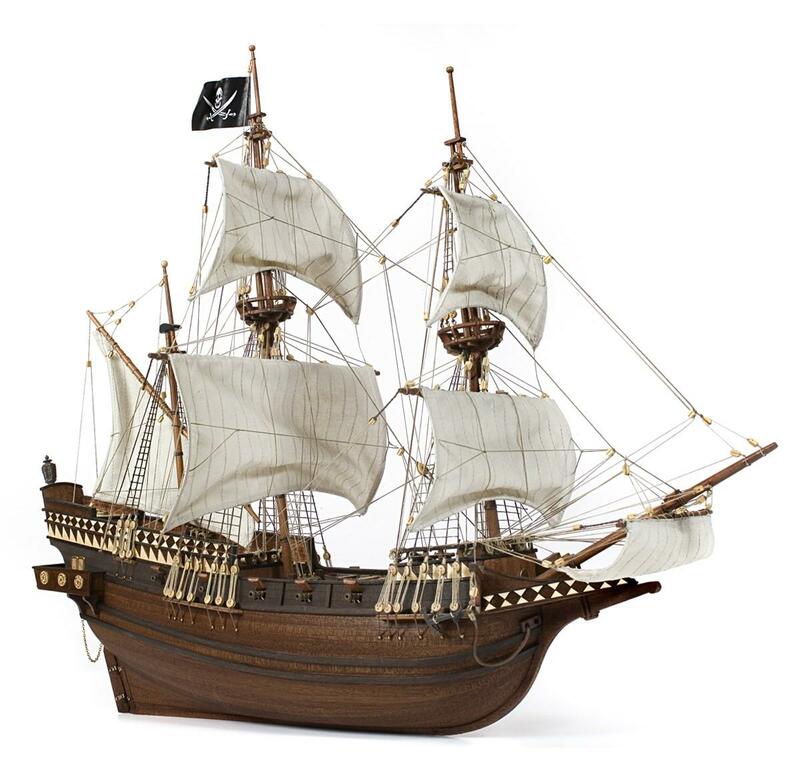 This entry was posted in Kit Reviews, Ship Modeling News, Vendors and tagged Ages of Sail, Buccaneer, Occre, Pirate Ship Model Kit, Wooden Ship Model Kit on December 16, 2015 by catopower. 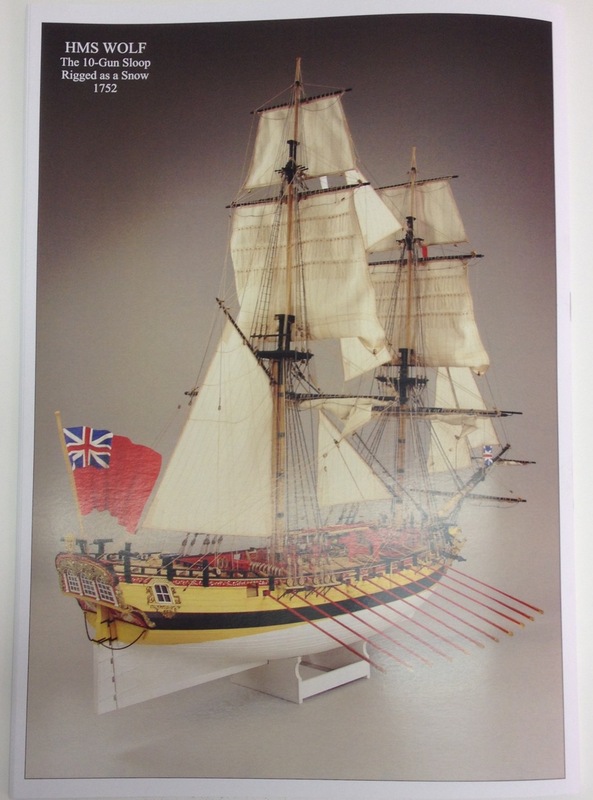 Recently, Ages of Sail, the importer I’ve been doing some work for this past year, has gotten in a new shipment of card or paper model kits from Shipyard of Poland. The most recent significant addition is the boxed Laser Cardboard Series kit HMS Wolf, 1752, and I managed to take a look at the product and get some photos so you can get a better look at what’s included in this kit. First off, HMS Wolf was a snow-rigged brig of war, meaning she carried two square-rigged masts, with an auxiliary mast attached to the back of the mainmast that carries the boom and gaff of the spanker sail. The ship was armed with 10 guns. 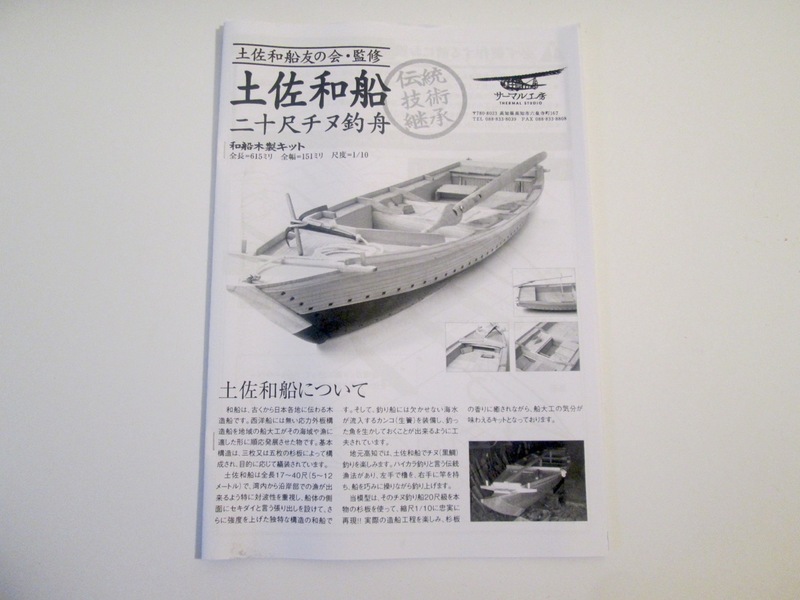 The Shipyard kit is produced in 1/72 scale and measures about 20.5″ long overall. 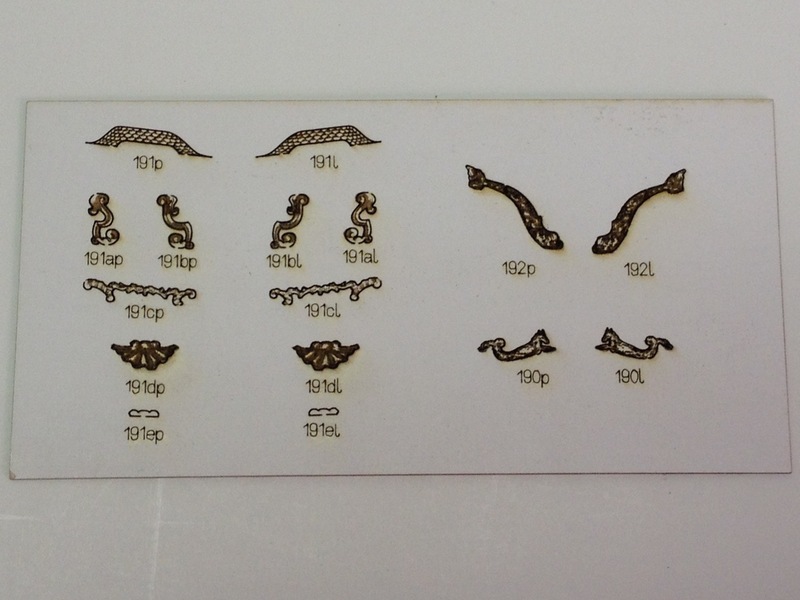 As with all Laser Cardboard Series kits, the boxed kit has all card stock parts laser cut. Colorful hull decorations are nicely printed on high quality paper, but the bulk of the parts are on plain white card stock, so the model must be painted. For that, the manufacturer includes several jars of nice quality acrylic paint and a pair of brushes. Parts are neatly stored, while all the instructions, drawings and laser-cut sheets are kept safely underneath. Blocks are also the same laser-cut blocks that Shipyard sells separately. These are paper and have to be assembled and painted. The low-level relief carvings are laser etched card stock, and look pretty nice. And, of course, the heart of the kit are the several sheets of laser-cut parts. Having been working on a paper model kit where all the parts have to be cut by hand, the sight of these precisely cut and detailed parts just makes me drool. But, not all paper modeling is necessarily done in paper. 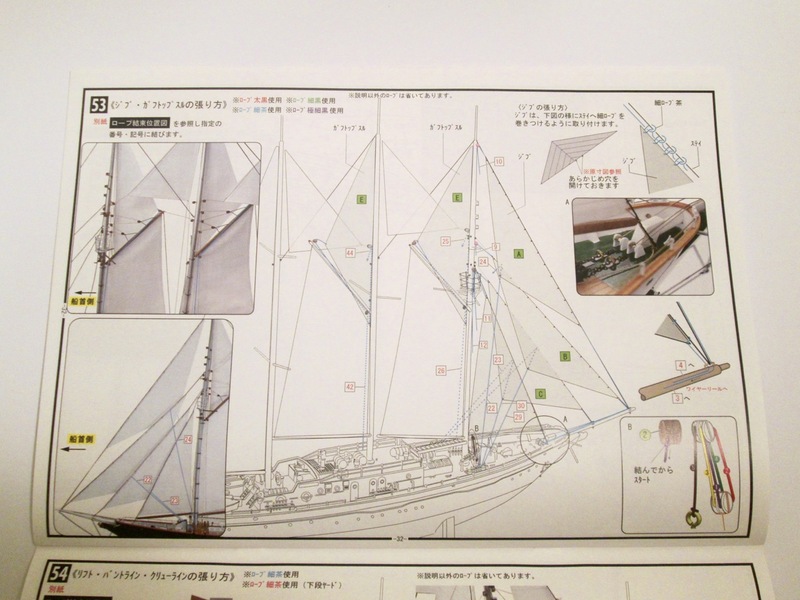 For one thing, wooden dowels are included for making the masts and spars, and a set of cloth sails are included as well, though as with individually available sail set for the their Paper Model series kits, these sails are pre-printed and laser cut, so no cutting or sewing is required. Another big time saver of these boxed edition kits are the pre-made brass cannon and swivel gun barrels, which are not only pre-made, saving time and effort, but they’re beautifully turned from brass. 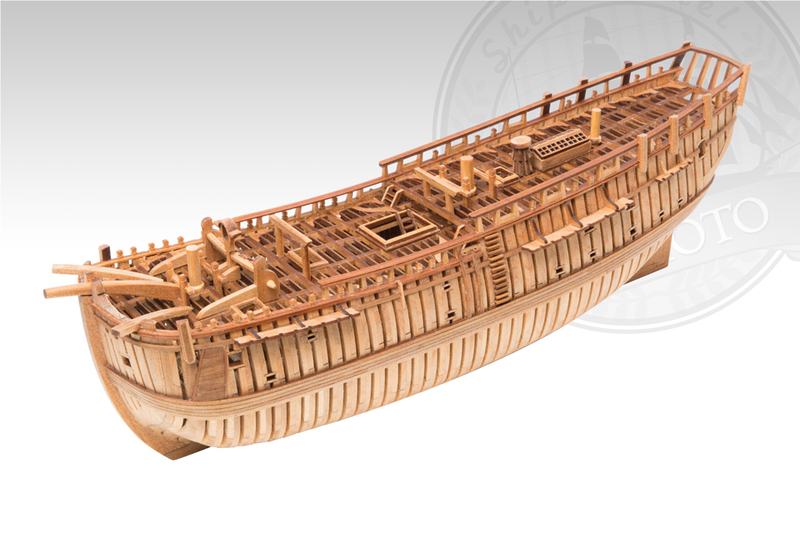 One of the big features of the Laser Cardboard Series kits is that low-relief carvings are made from laser-etched card stock, the figurehead and some of the larger carvings are fully 3D rendered in cast resin. Other parts included in the kit are rigging line, wire for making eyebolts and chainplates and such, clear acrylic for the gallery windows, and colorfully printed cloth flags. 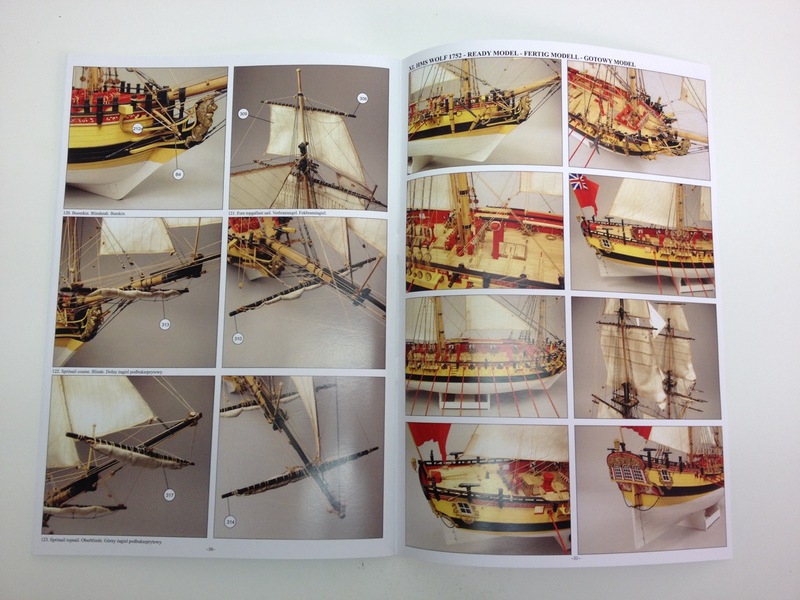 But, maybe the biggest thing that differentiates the boxed kit from its smaller Paper Model Series cousin (HMS Wolf is available as a 1/96-scale pre-printed card model kit where you have to cut all the parts out yourself) is the full-color, 32-page, photo-filled instruction book. This is in addition to the 7 double-sided sheets of drawings. 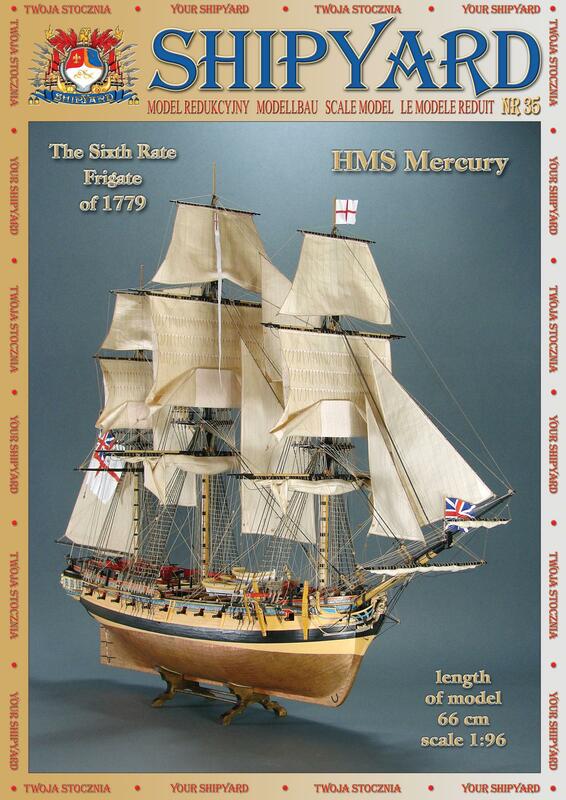 This entry was posted in Card Models, Kit Reviews, Product Review, Ship Modeling News, Vendors and tagged Brig, Card Model, HMS Wolf, Paper Model, Shipyard, Snow-Rig on September 5, 2015 by catopower.